Chaim Soutine was born in 1893 in Smilovichi, a small town twenty kilometers from Minsk, mostly inhabited by very religious Jews. His father was a tailor. He was second last in a family of eleven children. He started to draw at a very young age. When he was thirteen, he secretly drew the portrait of the village rabbi, thus transgressing the prohibition to represent the human face. He was thrashed by the son of the rabbi, who worked as a butcher, and spent fifteen days in hospital. The Soutine family received a twenty-five ruble compensation from the justice system. This sum of money enabled Soutine to leave Smilovichi. He did not say much about his childhood in the shtetl and did not like to talk about it. From 1907, he took drawing classes in Minsk and became friends with Kikoine. At the same time, he worked for a photographer and learned to retouch pictures. He enrolled in the School of Fine Arts in Vilnius, where he met Krémegne. In 1913, in Paris, Soutine and his two friends lived at La Ruche and studied at Fernand Cormon’s studio. 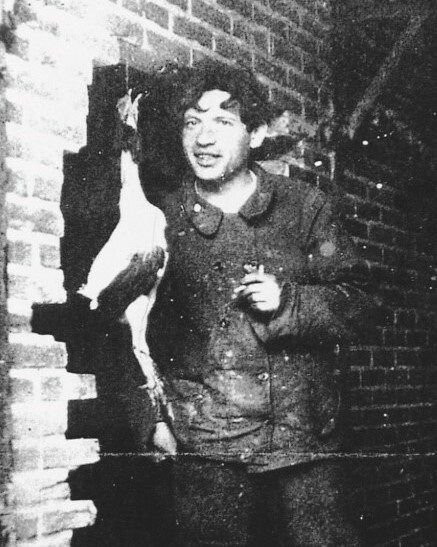 Soutine, who had no resources, lived in misery for ten years. He worked as a laborer for Renault and as a worker at the Grand Palais. In 1914, Soutine wished to join the army, but was not enlisted because of his poor state of health. He settled at the artists’ colony Cité Falguiere, where he shared a studio with the sculptor Miestchaninoff. In 1915, he met Modigliani through Lipchitz. The two painters became very close and their solid friendship lasted through everything. 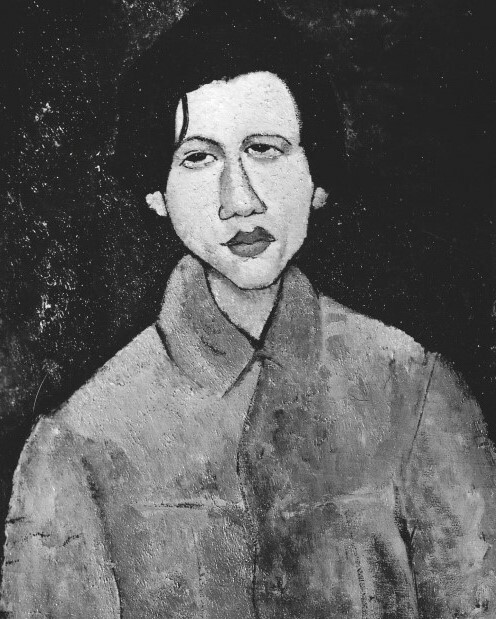 In 1916, Modigliani introduced Soutine to his dealer Léopold Zborowski for the first time, at 3 rue Joseph-Bara. Zborowski became the dealer for Soutine’s paintings without much success. At that time, Soutine painted still lifes, which concentrated on human misery. Zborowski paid for Soutine’s trips to the south of France: Céret, Cagnes, and Vence, which he visited until 1922. In 1920, in Céret, he found out about the death of his friend Modigliani and felt totally abandonned. His health got worst. At the request of Netter, Soutine’s first true admirer and collector, Zborowski helped the artist to get back to Paris. He found another precious ally in Paulette Jourdain, Zborowski’s assistant and Modigliani’s former model. She became his model and confidante. The American collector Albert Coombs Barnes noticed The Little Pastry Cook at Paul Guillaume’s gallery. He bought it right away and asked to see more of the artist’s works. Paul Guillaume took him then to Zborowski’s who showed his guest Soutine’s latest paintings. These mind-blowing landscapes won Barnes over. As Paul Guillaume stated in Les Arts à Paris, Barnes’ purchases ensured Soutine’s first success. The collector bought several of his works for 3,000 dollars in December 1922. Overnight, Soutine attained glory. 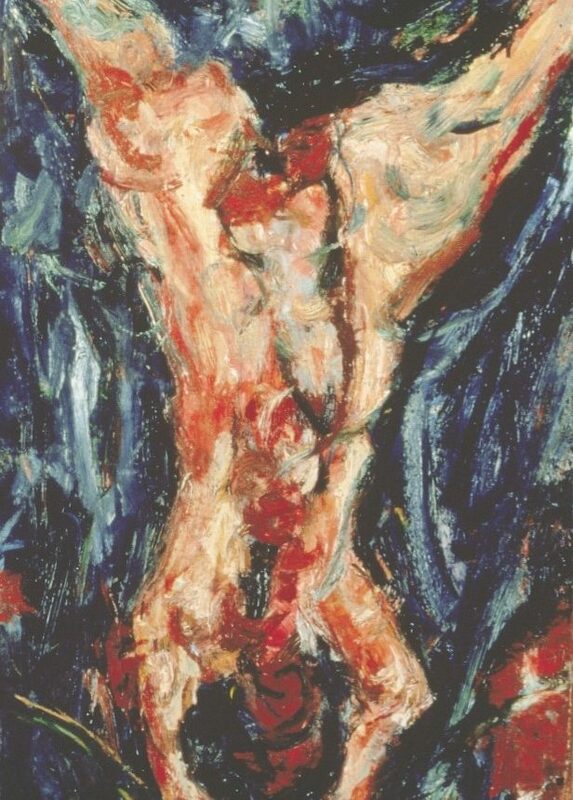 In Montparnasse, he became a “hero.” Zborowski gave Soutine a twenty-five franc salary every day. The artist also had a car and a chauffeur at his disposal. People sought his works, whose prices rose. For the first time in his life, Soutine had money. He turned into a dandy, liked gray felt hats with a broad ribbon, and pretended not to know anyone at Le Dôme and at La Rotonde when going past the cafés. He wore very elegant shirts and ties as well as a red silk scarf. From 1924, Soutine became friends with the Castaings, who he had met at La Rotonde in 1923. As he finally experienced material comfort, he was able to rent a studio and an apartment. He painted carcasses of beefs, numerous still lifes depicting poultry, and portraits of domestics. One day, with Zborowski’s money, Soutine and Paulette Jourdain bought a quarter of beef at the slaughterhouse in la Villette. He hung it and started to paint it. Shortly afterwards, flies started to swarm and the neighbors filed a complaint because of the smell. When the sanitation services arrived in the studio, Soutine was terrified and hid out. Paulette stood up for him and explained that the painter had not finished his work yet… In 1926 and 1927, Soutined stayed in the Berry region, at a house acquired by Zborowski. During the following years, when Soutine stayed in the countryside, he lived at the Castaings’ home near Chartres. In 1928, he painted the portrait of Madeleine and started his series of altar boys. In 1927, his first solo exhibition took place in Paris at the Galerie Bing. Soutine quarreled with Zborowski regarding money issues. The painter had financial problems and settled at a hotel in boulevard Raspail. His stomach pains got worse and prevented him from working. From that year, he became Madeleine and Marcelin Castaing’s protégé. They supported him and enabled him to paint. However, Soutine did not overcome his anxieties and continued to seek his earlier works in order to destroy them or paint over them. From 1931 to 1935, he spent a part of the summer in Leves, where he met Elie Faure, Erik Satie, Jean Cocteau, Drieu la Rochelle, Blaise Cendrars, and Maurice Sachs. Following Zborowski’s death in 1932, the Castaings provided him with his main source of income. In 1937, he settled in Villa Seurat where Henry Miller and Anais Nin were living. At number 18 Villa Seurat, “everything was dirty and miserable, the furniture was covered with dust and butts were scattered on the floor. Some copies of works by Rembrandt, Corot, and Courbet were tacked up on the wall. His books: Balzac, Russian novels, Montaigne’s Essays. He was a secret and lonely man, very suspicious and […] as little effusive as possible. Everything about him was strange. When he was working in his studio, he could not stand to be disturbed. He used a great number or brushes and, in the heat of the composition, he used to throw them on the floor one by one.” (Mademoiselle Garde, Mes années avec Soutine). In 1937, he met Gerda Michaelis at Le Dôme café. He called her Mademoiselle Garde (Miss Guard), after she had sat by his side for a whole night as he was suffering from bad stomach pains. In early summer 1939, they left for Civry-sur-Serein together. There, Soutine painted The Road to L’Isle-sur- Serein, which was then lined by tall poplars. This road inspired Soutine to paint several paintings. The war was declared at the beginning of September 1939. Soutine wanted to return to Paris but Civry’s mayor Mr Sebillotte told him that he and his partner were under house arrest and were not allowed to leave Civry. He was Jewish and Mademoiselle Garde was German. In May, Mademoiselle Garde was deported to the Gurs internment camp. Gurs turned out to be in the Free Zone shortly after she was interned, and women who could provide a proof of address were freed. When Mademoiselle Garde returned to Paris, Madeleine Castaing told her that Soutine now lived with Marie-Berthe Aurenche, who was Max Ernst’s former wife.